Three months ago, I purchased the Carol’s Daughter Monoi Hair Repairing Line. 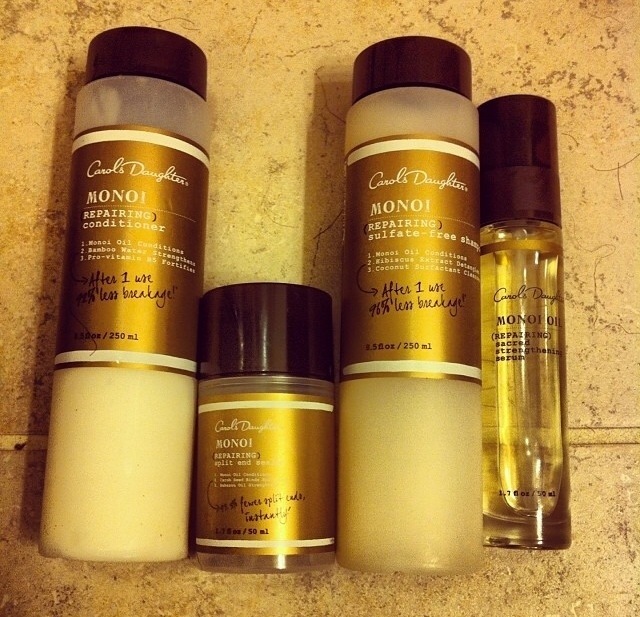 Carol’s Daughter ALWAYS has great sales going on and I was able to purchase a Monoi set (below) consisting of shampoo, conditioner, split end repairing cream, and monoi oil for about $50 instead of the almost $100 it would usually cost! I also, separately, purchased the Monoi styling spray that I spray onto my hair before heat styling as well as the Monoi deep conditioning treatment. I purchased all of these products, not just because I’m a product junkie, to determine if this line actually reduces breakage and shedding as it claims. I have to admit that I was a skeptic, but after using all these products for three whole months, I have to say that these products (as well as Hairfinity) truly helped to grow my hair, reduce breakage AND shedding, and make my hair that much thicker and fuller. These items can be purchased on the Carol’s Daughter website and have already been reviewed on my blog. Below are pictures of my growth and the set I purchased. The first picture is my BEFORE picture in January and the last picture is my NOW picture. Shine, Shine, Shine!! This oil gives my hair some serious shine with a side of moisture! I have a love/hate relationship with Carol’s Daughter products because, unlike my beloved SheaMoisture, these products can be a bit iffy. Sometimes they work, sometimes they don’t. However, the whole Monoi line (I will review each product in detail soon) has not let me down yet! I was able to purchase this product from the Carol’s Daughter website on sale! It is 1.7 fl oz. 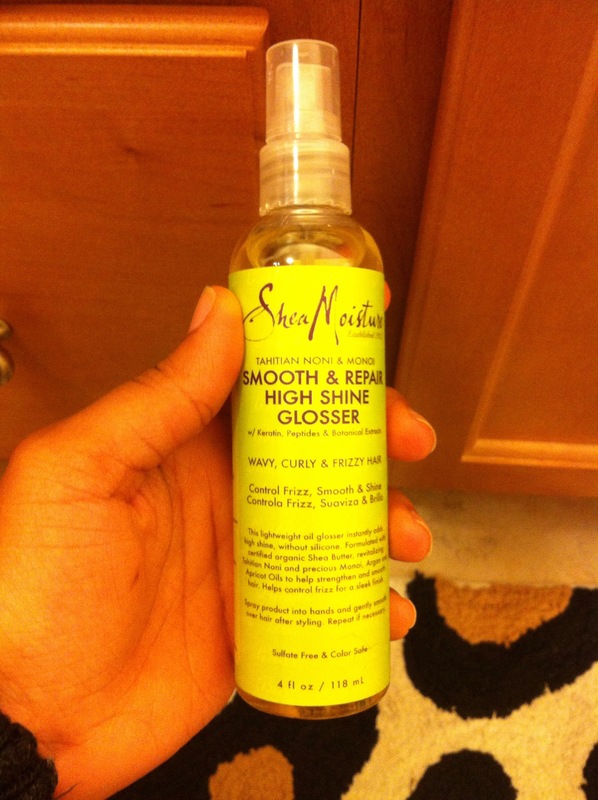 I use this oil when doing wash and go’s, when doing the LOC method and before heat styling my hair. When doing wash and go’s, I apply this oil (to freshly washed hair), after spraying my favorite Nothing But Curl Wake Up Spray. Afterwards I apply a curl defining crème. My favorite, as of recently, is Aunt Jackie’s Curl Defining Custard. When using these two products together (pictured below), you are sure to get well defined, SOFT, moisturized, shiny curls! Love! 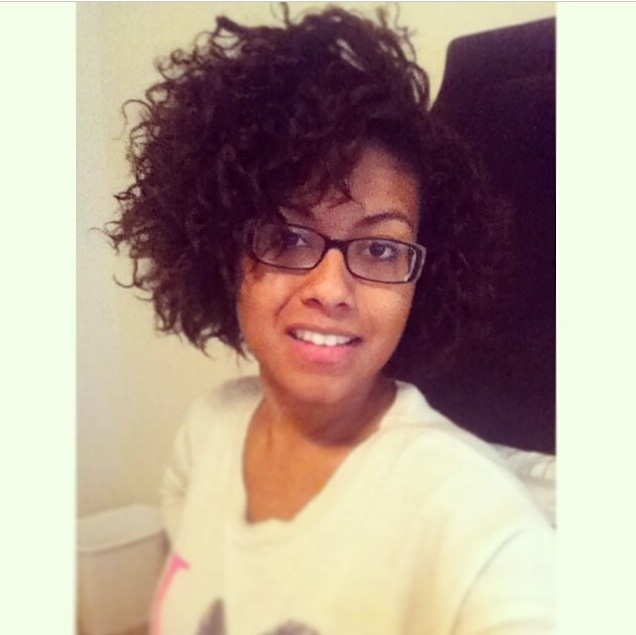 When using before heat styling, I apply a good leave in conditioner first. My favorite is Eden’s Coconut Shea All Natural Leave In Conditioner. After applying this leave in conditioner, I apply this oil. The instructions say to use 2 pumps initially and an extra pump if more frizz protection is needed. Anyone naturalista, curly head or thick haired woman period knows that, unless the product specifically caters to women with thick hair, you have to apply more than the recommended amount. This YouTube video shows exactly what I mean! So, I generally apply about 2 pumps per side of my head. Please be warned though, 2 pumps will be sufficient even if it does not seem as so at first!! Too much of this oil, like any oil, can lead to limp oily hair! Overall, I love this oil! 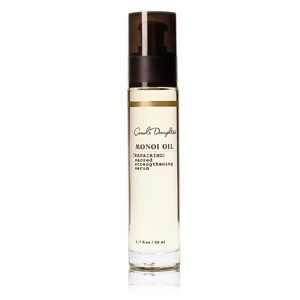 This oil, similar to the whole Carol’s Daughter Monoi Line, promises to strengthen hair and reduce breakage. UPDATE*–After using this product for five months, I can truly say it worked! There are times, hopefully rarely, that a woman will spend hours conditioning and straightening her locks only to finish and realize that she’s missing that extra “oomph!” That last bit of pizzazz that takes a 99.99 to a straight 100. 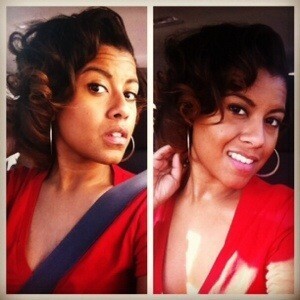 That’s where SheaMoisture, once again, makes my hair and my mouth smile! This high shine glosser truly gives hair that last bit of shine and moisture that it needs after a good straightening sesh. I purchased this product from Target for $10 for 4 fl oz. 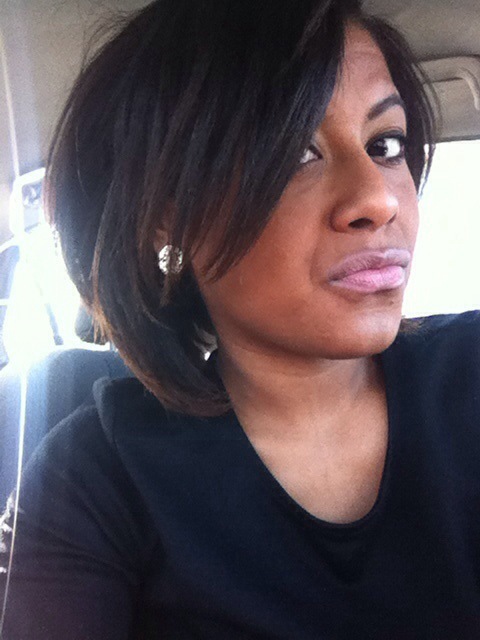 The instructions say to spray product into hands and gently smooth over hair after styling. I repeat, after styling! With heat. 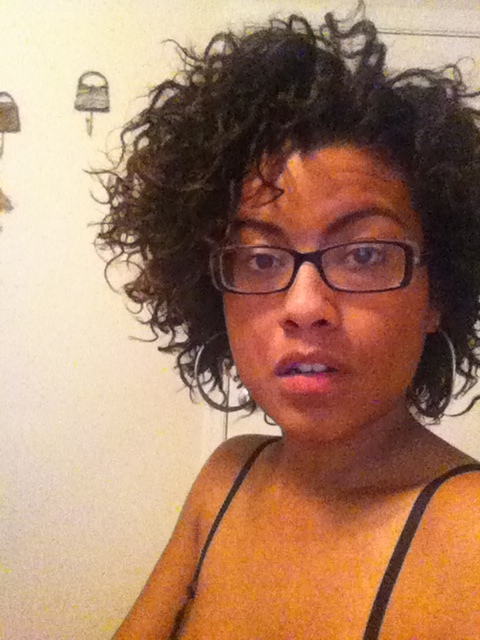 Normally, I would use the SheaButter Reconstructive Elixir after heat styling my hair. It’s always has that light weight touch that gives hair a great scent, shine and provides moisture. This spray, however, delivers the same but is specially formulated for wavy, curly and frizzy hair. It contains keratin, monoi oil and Tahitian noni which, combined, are meant to repair dry damaged hair, smooth flyways, and maintain hair health! This spray is not as lightweight as the elixir, so it’s wise to use about 2-3 pumps for your whole head of hair. And this is coming from someone with thick thick hair. 2-3 pumps gets me right! Great shine, no frizz and a nice scent! This is a new staple of my heat styling regimen! Below are pictures of the product and ingredient list as well as a picture of the front part of my hair (severe layers) with the product freshly applied! 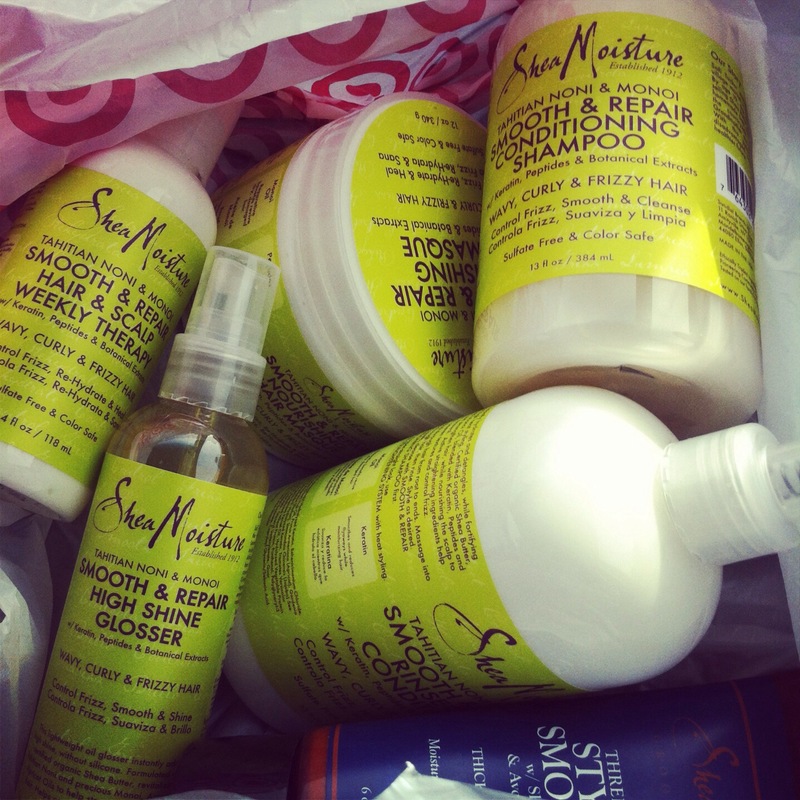 If it’s not apparent by now, I am a HUGE SheaMoisture product junkie! This line is truly truly my favorite hair care product line! So, it is with much enthusiam that I can announce that they have a new product line that is available in select Target stores. The Tahitian Noni & Monoi line. 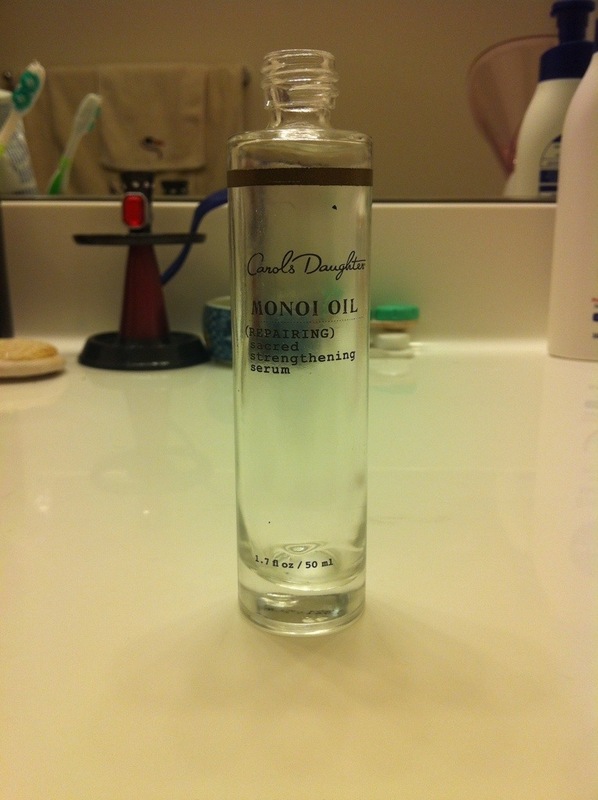 In the Monoi section (this section) of my blog, I expand on the many benefits on monoi oil for hair. Again, this Huffington post article does a great job of expanding on the many benefits of adding Monoi oil into your hair regimen. These products promise to infuse hair with a powerful dose of moisture with “certified organic Shea Butter, revitalizing Tahitian Noni, Monoi Oil and other blended ingredients that smooth the hair cuticle, control frizz and maintain straight styles.” This post also goes more into detail about what each individual new product promises to do. I finally was able to get my hands on ALL of these products! As promised, I’ve reviewed them all! If it’s not apparent by now, I struggle to get a multitude of pictures BUT I did find a great YouTube reviews for those of you that are more visual. This first YouTube video has great demos and the second is very informative as well. The picture below does, however, show the results I achieved! 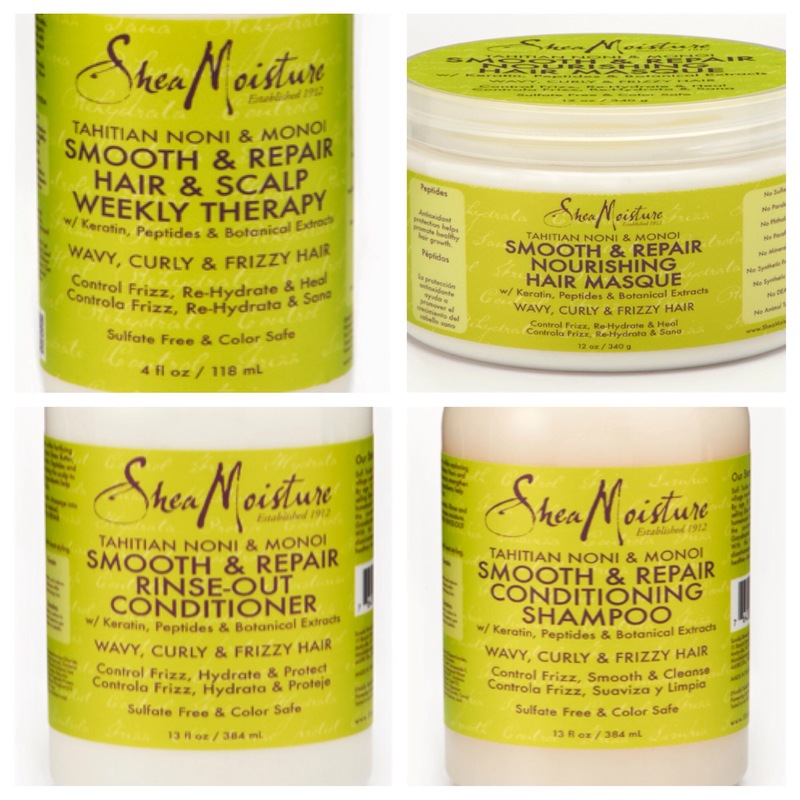 Overall, these products REALLY delivered with moisture, anti-frizz and shine. They also cut down my styling time tremendously!! 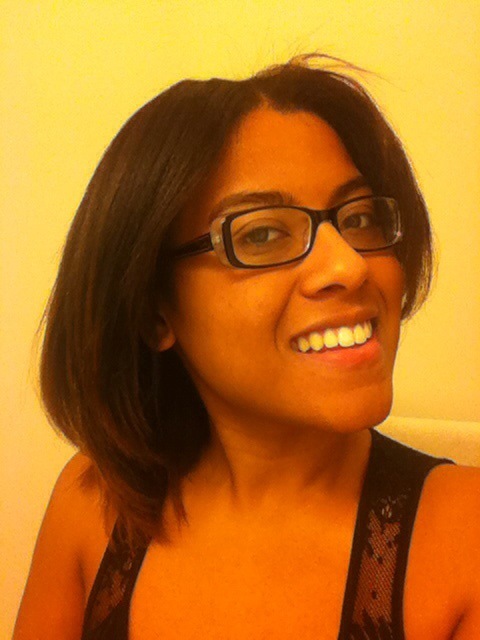 My blow out took less than an hour! Usually it takes about an 1 hour 45. Tragic! With that being said, I would recommend this new line for those that will be using heat to style their hair. You will see an increase in manageability, moisture and shine and a decrease in frizz! I could gush about these new products for hours, but instead, I encourage you to watch these YouTube reviews and read mine as well! Enjoy! These products promise to infuse hair with a powerful dose of moisture with “certified organic Shea Butter, revitalizing Tahitian Noni, Monoi Oil and other blended ingredients that smooth the hair cuticle, control frizz and maintain straight styles.” This post also goes more into detail about what each individual new product promises to do. While I haven’t been able to get my hands on any of these products just yet, I will be sure to purchase ALL of the ones pictured below and do prompt reviews on them. Additionally, once the list of all the select Target stores that will be carrying this line is released, I will make sure to add that to this post! This product easily makes my top five favorite products!! All my life I have struggled with split ends. 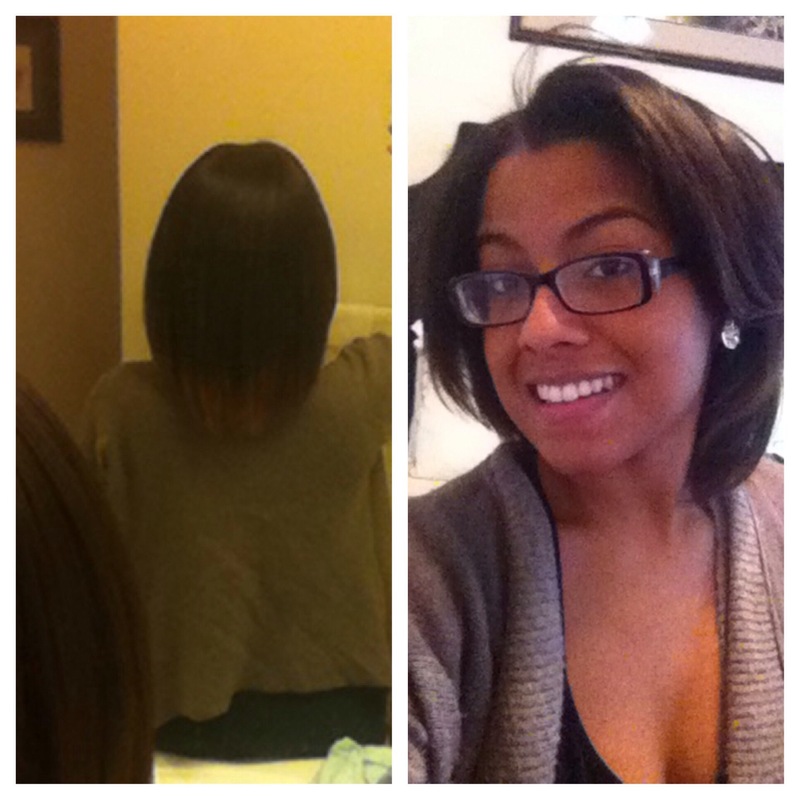 Heat damage, chemical damage and mistreatment of my hair have resulted in split ends for years and years. As I’ve gotten farther along in my healthy hair journey, however, I’ve begun to learn how to take better of my ends and treat them with the tender love and care that they deserve leading to length retention. Something we allll love! 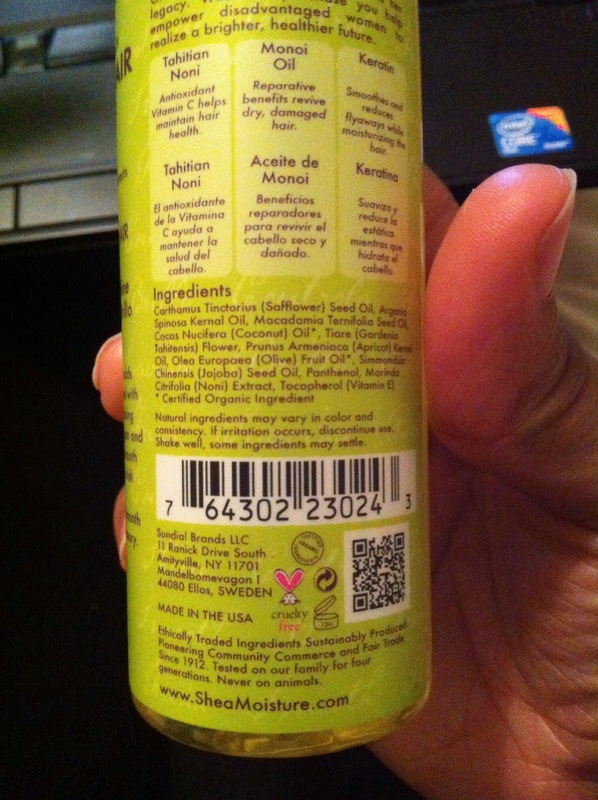 I purchased this product from the Carol’s Daughter website for $23 for 1.7 fl oz. A little expensive, I know, but it truly is worth the price! I found a great YouTube video review of this product that lets you see what her hair looks like before and after using this leave in, since I always forget to take pictures! I use this product on wet or dry hair. When using this product on wet hair, it’s usually when I’m doing a wash and go. I part my hair into four section and apply this leave in on my ends. I then follow up with one of my DIY sealants (shea butter, mango butter, jojoba oil etc) to ensure that I lock in all the amazing moisture that this product provides. When I’m not doing a wash and go, but my hair is still wet, I apply a light amount of this product as I’m sectioning off my hair before a blow out. When I’m finished blowing out my hair, and I’ve applied this product as a part of my styling regiment, my ends ALWAYS look like they’ve been freshly trimmed!!! Now, when I use this on dry hair, I use the LOC method, as mentioned in this article. I do this every other night before I go to bed, especially in the winter months, and always wake up to moisturized ends. Incorporating this technique in your hair regimen stretches the amount of time that you can last before you’ll need a regular trim (4/6 weeks regularly, 8/10 weeks if you’re growing hair out). Following the trend of argan oil and its wide use in the U.S., the wonders of monoi oil are recently being discovered here as well. So, what’s all the rave about monoi oil about? Well, this oil is cultivated by soaking Tiare Tahiti blossoms in refined coconut oil. Thus, this oil is actually quite similar to coconut oil. Coconut oil which is the ONLY oil that is strong enough to penetrate the hair shaft. Similar to coconut oil, monoi oil is rich in protective antioxidants like Vitamin E and is excellent for locking in moisture! When your hair is dehydrated or demaged, monoi oil can be applied as a mask that will deep condition from root to tip!! Need to find a great place to get all natural monoi oil? Try this link! 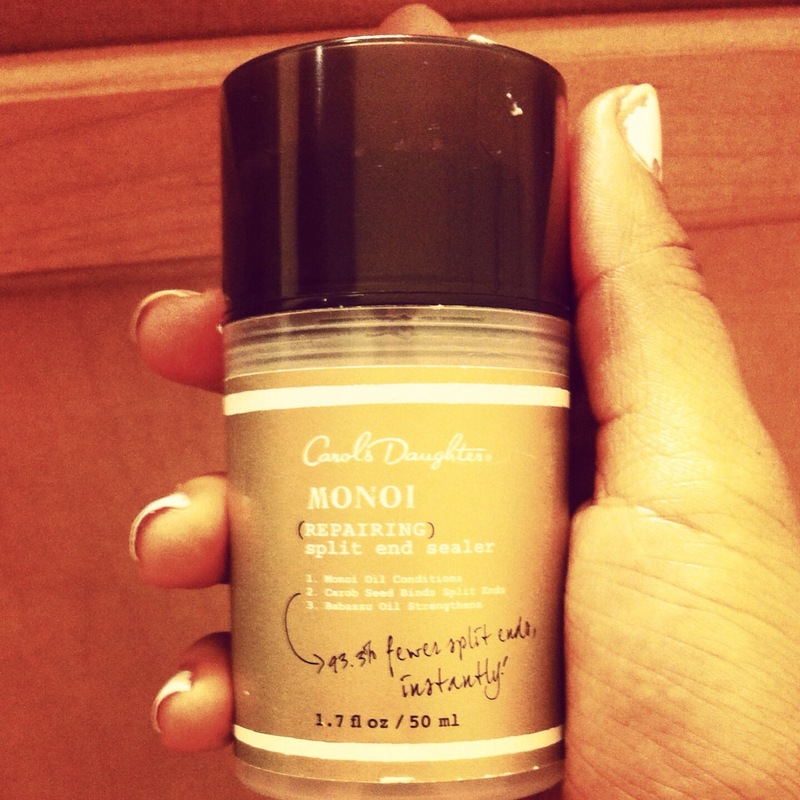 OR Carole’s Daughter, Nars and many others have products infused with monoi oil, such as the one pictured below. This link is also a recent article in the Huffington Post that also features many products infused with monoi oil as well!